On January 20 many Brazilians celebrate the orixá Oxóssi (pronounced oh-SHAW-see) who manifests as vegetation and is represented by the forests that provide food for the world. He also represents the abundant harvest and prosperity. 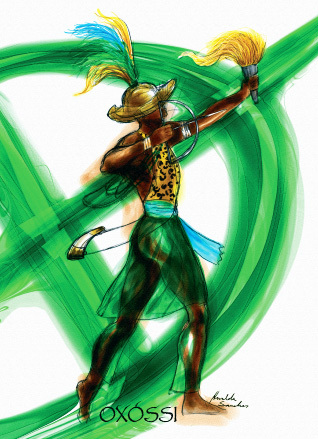 Oxóssi is characterized as a lone hunter with a bow and arrow and is an excellent tracker who is supplicated to find a path out of any difficult situation, a solution to any problem, or to achieve a targeted goal. His colors are green and sky blue, and offerings for him are axoxó (red corn with coconut), various fruits, roasted black eye peas. He is also syncretized with the Catholic saints George and Sebastian.